Against the very challenging background of ongoing grave civilian harm during armed conflict, the prohibition and restriction of certain conventional weapons should be a high priority for all states. I would like to raise a few key topics in this regard. 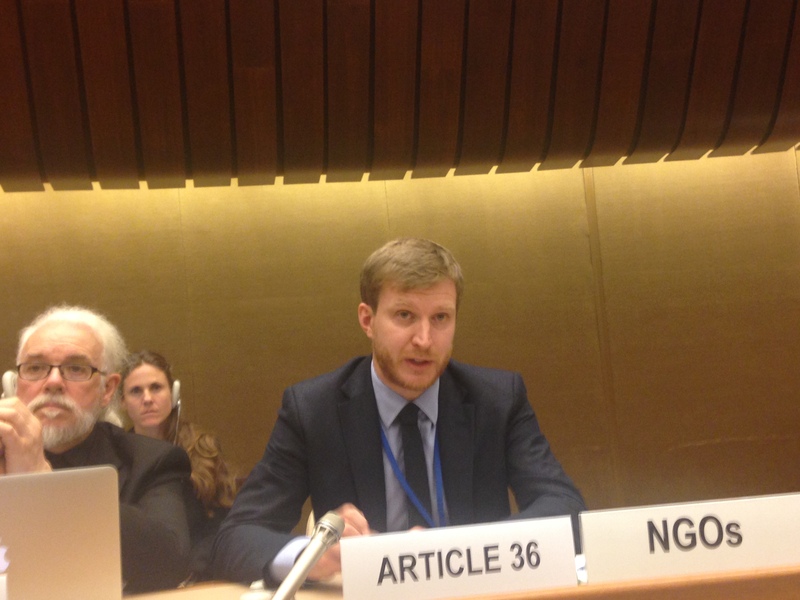 We are encouraged by the discussions on autonomous weapons over the past 12 months since the CCW took up this theme and we look forward to these discussions continuing and intensifying in 2015 with a view to developing new international rules. In our view, an acknowledgment by states of a broad requirement for meaningful human control over individual attacks is the right place to start. This should constitute the common ground for the next steps in the international deliberations on this theme. Weapons that detect and engage targets challenge the concept of meaningful human control. We hope that states will come prepared next year with concrete examples of how they manage weapons systems that detect and engage targets to ensure that individual attacks are always under meaningful human control. In our view, this material will helpfully inform a discussion of the sorts of specific controls – and new international rules – that will be needed to prevent the development of fully autonomous weapons. We also welcome the significant growing interest this year in the need for weapons reviews. In our view, states should draw on their experiences from other areas, such as public health, in terms of how best to assess developing technologies. We believe that focused discussions about how such processes can be strengthened and universalised would be very valuable in the context of the CCW, or on the margins. At the same time, we would not be convinced by suggestions that national weapon review mechanisms constitute a sufficient response to concerns regarding the development of autonomous weapons systems. Given that there is currently no agreement regarding the level and nature of human control required, leaving it up to national reviews on a case by case basis would likely result in widely divergent standards especially given deficits of transparency. This is in line with our recommendation that states should explain their controls over existing weapon systems. Discussions should not be limited to ‘virtual technology’. It is not just new weapons that should be subject to continued assessment and review, though. Incendiary weapons have been on the agenda of the CCW from the beginning. At the 1979 diplomatic conference that led to the CCW, a 22-nation proposal suggested an outright ban on any use in any circumstances. Human Rights Watch has documented significant civilian harm from recent use of incendiary weapons during the current conflicts in Syria and Ukraine. Against this background and given the limitations of the protocol’s definition of incendiary weapons, as well as the loophole permitting certain use of ground-launched incendiary weapons, we believe this question should be revisited on the terms of that 22-nation proposal from 1979 – that incendiary weapons should be prohibited from use. We would invite those states involved in that proposal to lead the way on this topic in the CCW and we welcome the support from the Netherlands and others for formal deliberations to strengthen protocol III. As well as concerns over superfluous injuries, one of the central problems posed by incendiary weapons is their wide area impact. And as we look back on 2014, it is the wide area impact of explosive weapons – used in populated areas – that stands out as the leading cause of harm to civilians. In Syria, Ukraine, Gaza and elsewhere, we have seen a heavy toll of civilian deaths and injuries from the bombing and shelling of towns and cities. The destruction of infrastructure and displacement of people will leave a lasting legacy. The use in populated areas of such explosive weapons – including artillery, multiple barrel rocket launchers and air-dropped bombs – is perhaps the most important humanitarian challenge regarding protection of civilians. Explosive weapons that have wide area effects are inappropriate for use in populated areas. Their use in populated areas should stop.